The Wellness Center’s success lies in the health and well-being of our patients. As we touch one life at a time, we would like share few of the individual stories in our patients’ own words. Two years might not seem a long time, but to Araqsya felt like a life time. She and her husband desperately wanted to start a family. Lucky for her, her mother-in-law was a patient at the Wellness Center and had heard about their infertility treatment program. “I went to see Dr. Marine Voskanyan at the Wellness Center. I was so impressed with her medical expertise and kind personality. After ten months of treatment, Dr. Voskanyan confirmed my pregnancy. We were all overjoyed.” Araqsya gave birth to a baby boy, Artak, on May 3, 2012. “His birth has brought so much joy to our family and a new meaning to my life,” she said. Tatevik, first visited the Wellness Center when she was 16. “I was experiencing severe problems in my cervix. After a thorough examination, I was diagnosed with Polycystic Ovary Syndrome and was successfully treated. I got married when I was 18 and struggled to have a baby for two years. Eventually, I decided to visit the Center again; this time with my mother-in-law, who was also a patient there. After eight months of treatments, my gynecologist confirmed, to my great joy and surprise, my pregnancy. On October 11, 2010, I gave birth to my daughter, Kariné. She brought so much happiness to our family and a new meaning to my life,”shared with us Tatevik. Nariné first came to the Wellness Center after seeing a TV program about the Center’s success stories in treating infertility. “My husband and I had been trying to have a baby for eight years. I had undergone multiple unsuccessful treatments and had given up hope. I was left with the bitter reality that I would never be a mother. The TV program inspired me to give myself one last chance. From my very first visit, I was impressed with the caring attitude and medical professionalism of the staff. The gynecologist gave me hope that I still had a chance to be a mother. After receiving treatments for three months, she confirmed my pregnancy. On March 18, 2009, I gave birth to a healthy little boy, Manvelik, who has brought joy and happiness to our family,” said Nariné. Testimonials of Breast Cancer Survivors – few of many…. We speak to people affected by breast cancer every day, so we are uniquely placed to source compelling case study stories; here is a snapshot of some of the experiences of our patients. 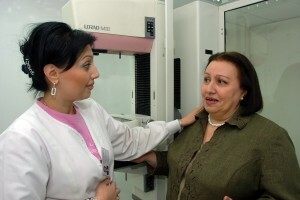 “In May 2006, I saw a TV interview about the early detection of breast cancer, especially for women after the age of 40. The next day I visited the Wellness Center and I never expected that cancer was already in my breast. Thank God that it was in its initial stage. I had only partial removal of my breast followed by radiation therapy. Since then, the Center has scheduled my visits for every six months and has followed my general health. In April 2008, during one of my regular visits, the Center found post-operative changes in my breast and structural changes in my thyroid nodules. The physician at the Center recommended additional testing of my thyroid glands and they detected structural changes of the nodules, I was recommended to have surgery to remove them to prevent malignancy. My surgery was successful and I am fine now. I am ready for any advice the Center’s doctors give me. They are caring and know what they are talking about. Every day I pray for the blessings of God on the founders, donors and the medical staff of the Center. Because of their efforts, I am Alive today! I continue to enjoy teaching and spending time with my children. “If destiny did not lead me to meet Rita Balian in 1999, I would not be here today. I met her at an AIWA Symposium, organized by Hranush Hakobyan. Mrs. Balian spoke about the effects of breast cancer, importance of early detection, and shared the stories of her sister and sister-in-law and how their lives were saved through early detection. 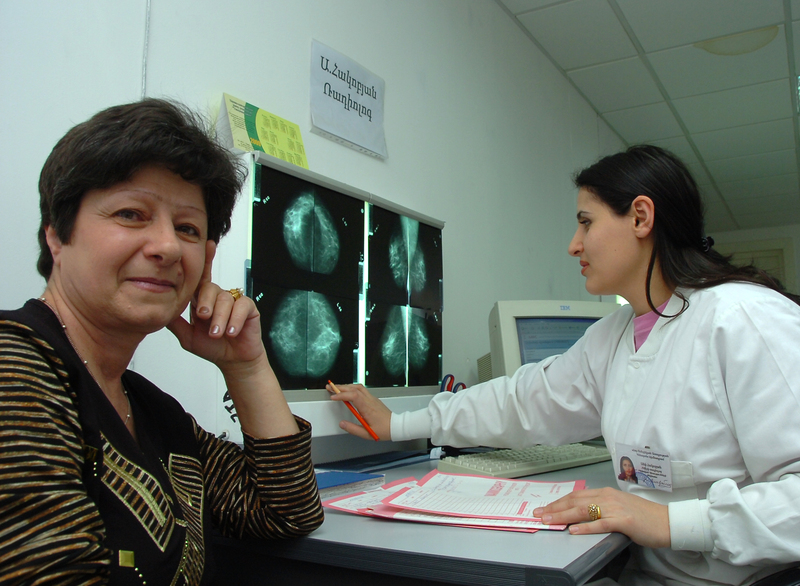 The next day, I was at the Center to have my first mammogram. I was devastated by the news, but a miracle happened and I am still alive today continuing to enjoy my family and my musical profession. I am even composing now. Thank God that my breast cancer was detected at an early stage. I had lumpectomy, radiation, and chemotherapy. The Center follows up with my health every six months, providing all the necessary tests, and they do everything to keep me alive and happy. 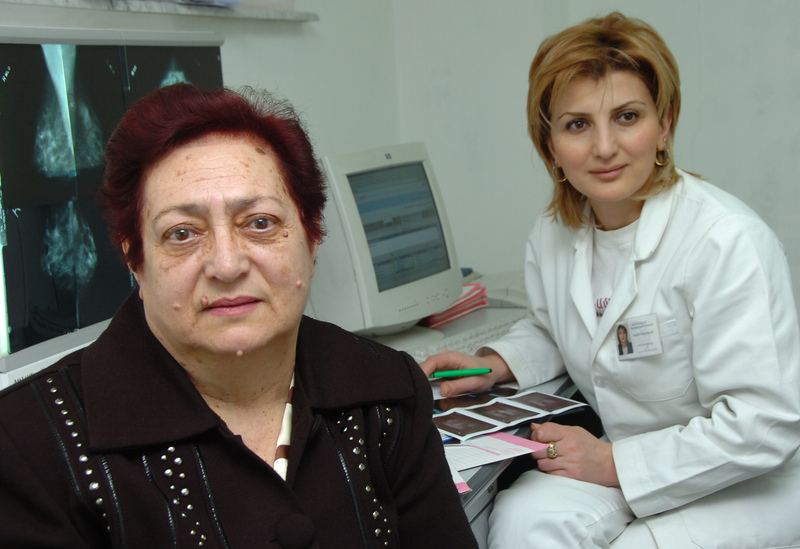 All I want to say is that I am Grateful to these two very special ladies who established the Center, to the U.S. Medical Professionals who came to Armenia to train our doctors, and to ALL the Donors who support this project. 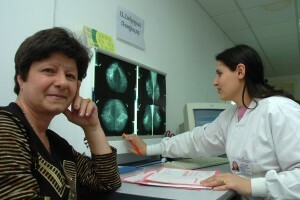 “In October 199, my neighbor told me how pleased she was of this new women’s health care center in Yerevan. When I went, I did not expect what I saw. The waiting room was packed, but very orderly. It was very different from all other “polyclinics” that I had gone to before. It was clean, modern, and everyone was polite and kind. I was given the utmost attention by the Radiologist, who did my first mammography screening. They waiting area was also very pleasant. It was decorated with children’s art, fresh flowers, and health information brochures. I felt like I was in a different country. At the Radiologist’s office, she explained that what she found was not good news and recommended that the oncologist should see me the next day.